Pope Saint Callixtus I, also written Callistus I and Callisto, was pope from c 217 to c 222 C.E., during the reigns of the Roman emperors Heliogabalus and Alexander Severus. Prior to becoming pope, Callixtus had suffered hard labor in the mines of Sardinia before being freed through the efforts of Pope Victor I during the reign of Emperor Commodus. He remained outside of Rome after his liberation until being summoned by his predecessor, Pope Zephyrinus (199-217), to serve as his deacon. Callixtus was placed in charge of the famous Christian burial chambers along the Appian Way which bear his name. As Zephyrinus' closest adviser, Callixtus earned the lasting enmity of the future Saint Hippolytus of Rome, so much so that Hippolytus refused to recognize Callixtus' later election as pope and formed a rival congregation with himself as antipope. Hippolytus and Tertullian were both upset by the Callixtus' admitting to communion those who had repented for murder and adultery. Hippolytus also accused him of theological error and toleration of heresy. Although there was little persecution against the Church during his reign, Callixtus was reportedly martyred around 222 during a popular uprising. He was succeeded by Pope Urban I. The Roman Catholic Church keeps the feast day of Pope Saint Callixtus I on October 14. Our chief knowledge of this pope is from his bitter enemies, Tertullian, who had become by this time a Montanist, and Hippolytus of Rome, who was Callixtus' rival and antipope. It is necessary therefore to take the facts they present with a grain of salt, while not necessarily dismissing their reports out of hand. According to Hippolytus' (Philosophumena c. ix) Callixtus was originally the slave of Carpophorus, a Christian in the household of the emperor. His master entrusted large sums of money to Callixtus, with which he started a bank in which Christian men and widows invested substantial sums. Hippolytus alleges that Callixtus lost all of this money and that he consequently took flight. Callixtus was eventually apprehended and consigned to the punishment reserved for slaves, the pistrinum, or hand-mill. However, the Christians who had invested with him begged that he might be released in order that they could retrieve at least some of their money. Callixtus then ran into even more trouble with a group of Jews—either because he insulted them during their synagogue worship (as Hippolytus claims) or over a related monetary dispute. The Jews brought him before the prefect Fuscianus. His master Carpophorus claimed that Callixtus was no true Christian, but Callixtus was sent to the mines in Sardinia as a confessor. Fresco in the Catacombs of San Calisto in Rome, named for Calixtus I, who was in charge of the cemetery during the reign of Pope Zephyrinus. Some time after this, Marcia, the mistress of Emperor Commodus, sent for Pope Victor I and volunteered to help win the freedom of any Christian martyrs still imprisoned in the mines. He gave her a list, Hippolytus says, without including Callixtus' name. After obtaining a pardon from the emperor, Marcia dispatched a priest to secure the release of the prisoners. Callixtus fell at his feet and persuaded the envoy to take him also. Hippolytus claims that Victor was annoyed at this, but, being a compassionate man, he kept silent. Callixtus, rather than returning to Rome and face dishonor, remained in Antium with a monthly allowance from Victor. When Zephyrinus became pope, he recalled Callixtus to Rome and placed him in charge of the cemetery on the Appian Way which belonged to the Roman church. Callixtus obtained great influence over Pope Zephyrinus—described by Hippolytus as ignorant, illiterate, and grasping—allegedly by means of bribes. Due to the fact of Hippolytus' bitter antagonism toward Callixtus, the above version deserves at least some deconstruction before we proceed. To Hippolytus, Callixtus was "a man cunning in wickedness, and subtle where deceit was concerned, who was impelled by restless ambition to mount the episcopal throne." Hippolytus himself, however, does not claim that Callixtus lost the money deposited with him through his own fault. Moreover, the fact that Carpophorus, a Christian, should commit his Christian slave to the horrible punishment of the pistrinum does not speak well for the master's character. On the other hand, the intercession of his fellow Christians on behalf of Callixtus speaks well for him and raises the question whether they were entirely motivated by financial interests, as Hippolytus alleges. The declaration of Carpophorus that Callixtus was no Christian was scandalous and untrue. Hippolytus' account implies that it indeed was as a Christian that Callixtus was sent to the mines, and therefore as a confessor. The story that he was omitted from Pope Victor's list of suffering Christians is dubious. It was clear that Callixtus was released as a Christian and even granted a monthly pension by Pope Victor, so we should be skeptical regarding the story that Victor regretted his release. Finally, it is unlikely that Zephyrinus, who reigned as pope for nearly 20 years, was ignorant and base. Although bribes are not out of the question, Callixtus could hardly have raised himself so high without considerable talents. Besides caring for the Christian cemetery along the Appian Way, Callixtus apparently served Pope Zephrynus as his archdeacon and closest adviser. It was in this capacity that he made a bitter enemy of Hippolytus. The latter blamed Callixtus for Zephrynus' refusal to intervene on behalf of Hippolytus' party in a theological dispute dealing with the nature of the Trinity and the Incarnation. Hippolytus argued that only God the Son (and not God the Father) incarnated in Jesus, while his opponent Sabellius and others took the view that the Incarnation occurred as a modality of God as a United Being. Zephyrinus declined to speak out forcefully against Sabellius and his colleagues, and Hippolytus grew increasingly bitter against him, making Callixtus the brunt of his angry denunciations and calumnies. Hippolytus also blamed Callixtus for Zephyrinus' policy of receiving back into communion such people as the arch-heretic Natalis, who had been the leader of an Adoptionist schism at Rome until a series of dreams led him to repent and beg Zephyrinus for forgiveness. Meanwhile, Hippolytus' own views on theology and Church administration were not endorsed by the pope, allegedly on Callixtus' advice. So vehemently did Hippolytus blame Callixtus for Zephrynus' supposed faults, that when Callixtus was elected the next pope, Hippolytus and some of his party separated themselves from the main body of the Roman Church, and Hippolytus served in effect as antipope. Callixtus' papacy was only one-fourth as long as his predecessor's, and for the most part he continued the policies he had helped Zephyrinus to develop and implement. He was apparently more of a conciliator than a judge, but his tendency to forgive brought him into conflict with the two of the most significant and unbending writers the age in Tertullian and Hippolytus. However, since he left no writings of his own, we are thus forced to rely on his critics for information about his views. Tertullian was outraged when Callixtus decreed that murderers and adulterers could receive absolution. Callixtus was challenged by both Hippolytus and Tertullian on the ground that he issued an edict granting communion to those who had committed adultery and even murder, after due penance. Tertullian characterizes the decree as follows: "I hear that an edict has been published, and a peremptory one; the bishop of bishops, which means the Pontifex Maximus, proclaims: 'I remit the crimes of adultery and fornication to those who have done penance.'" Doubtless Hippolytus and Tertullian were upholding the stricter moral tradition of earlier times. They thus regarded the pope, in decreeing a relaxation, as enacting a new and inappropriate law. However Callixtus based his decree not only on his position as Peter's successor, but also on the precedents of his predecessors during the early days of the Novatianist controversy, in which the "catholic" tradition was established that even the most serious sins—including apostasy and sacrificing to pagan idols—could be forgiven by the bishops. Other complaints of Hippolytus are that Callixtus did not submit converts from heresy to the humiliation of public penance for their sins before absolution; that he had received into his "school" (i.e. the Church) those whom Hippolytus had excommunicated; and that he declared that a mortal sin was not always a sufficient reason for deposing a bishop. Tertullian (De Exhort. Castitatis, vii) speaks with disdain of Roman bishops who had been married more than once, and Hippolytus charges Callixtus with being the first to allow this, which was against the rule of Saint Paul as established in his letters. Callixtus also allowed the lower clergy to marry and permitted noble ladies to marry commoners and slaves. Although Paul had insisted that "in Christ there is neither slave no free," such unions were forbidden by the Roman law. 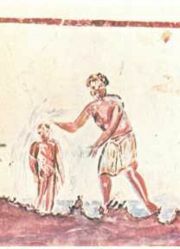 Hippolytus further declared that re-baptizing of heretics—later declared unnecessary by the church—was performed first in Callixtus's day, but he does hold Callixtus responsible for this. Hippolytus, nevertheless, indeed regards Callixtus as a heretic. He accuses him both of Di-theism and a type of Sabellianism. In fact, however, Zephyrinus and Callixtus had been critical of the theologies of both Sabellius and Hippolytus, and the latter had never forgiven Callixtus for refusing to influence Zephyrinus to support Hippolytus and condemn Sabellius. Interestingly, neither Tertullian nor Hippolytus criticizes Callixtus' moral behavior after his promotion to the papacy, nor do they argue against the validity of his election, even if Hippolytus does accuse him of bribery before the fact. 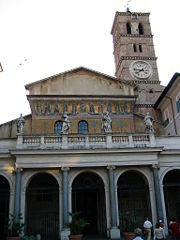 The Church of Santa Maria in Trastevere, where Callixtus' relics are housed. Callixtus is the earliest pope found in the fourth-century Depositio Martirum. Although his Acts are considered largely legendary, he may indeed have been a martyr, and was almost certainly a confessor who suffered greatly in the mines of Sardinia. Arguing against his martyrdom is the fact that his reign took place in a time of peace for the Roman Church under Alexander Severus, whose mother was a Christian. The story of his death describes a civil unrest in 222, which is confirmed elsewhere in the historical record. The legend that Callixtus was thrown from his house into a well and stoned to death, however, cannot be confirmed by secondary accounts. The Historiae Augustae relates that a spot on which Callixtus had built an oratory was later claimed by the tavern-keepers of Rome, but the emperor decided that the worship of any god, even the god of the Christians, was better than a tavern. This is said to have been the origin of the Church of Santa Maria in Trastevere. The Church of St. Callixtus is close by, containing the well into which legend says his body was thrown. He was buried in the cemetery of Calepodius on the Aurelian Way, and the date of his death, given by the "Depositio Martirum" and subsequent martyrologies, is October 14, which is also his feast day. His relics, since the ninth century, have been kept in the Church of Santa Maria in Trastevere. The United States Conference of Catholic Bishops introduction to the saints notes that Saint Callixtus is "most renowned for the reconciliation of sinners, who following a period of penance, were re-admitted to communion with the Church." 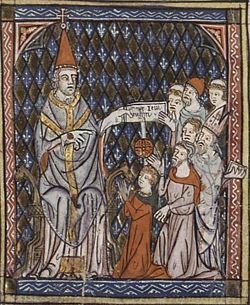 The Catholic Encyclopedia laments: "If we knew more of St. Callistus from Catholic sources, he would probably appear as one of the greatest of the popes." History of "Pope Callixtus I"